As Haiti prepares to hold Legislative and Presidential Elections on November 28th this year, more questions are being raised regarding whether unfair and exclusionary elections would be beneficiary for the country. 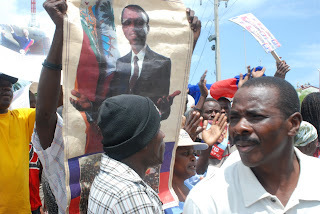 The Conseil Electoral Provisoire of Haiti, or CEP (Provisional Electoral Council) unjustifiably barred 15 political parties from running in the 2010 presidential elections, Fanmi Lavalas or FL, Haiti’s largest and most popular political party. The CEP barred FL from participating in neither presidential nor legislative elections. This decision by the CEP created unrest amongst national and international political leaders regarding the validity and credibility of the November 28th elections. A similar situation occurred in the April 2009 Senatorial Elections. The CEP banned Fanmi Lavalas, from participation. As a result, less than three percent (3%) of Haitians voted in the election. The CEP’s actions in the current Presidential and Legislative elections will likely cause the November 28th elections to be boycotted by a substantial number of qualified voters once again. The level of participation in this year’s campaign deeply contrasts with that of the 1990 and 2006 campaigns. In the aftermath of the 2010 earthquake, people are more concerned about their livelihood, rather than a Presidential Campaign. The lack of leadership in Haiti has also impacted the level of civic engagement amongst the majority. Most of the candidates in these President Elections, including former President Jean-Bertrand Aristide’s Prime Minister Yvon Neptune, Yve Cristalin, Charles Henry Baker, and Mirlande Manigat, are widely regarded in Haiti as those who betrayed President Aristide, or participated in the 2004 coup d’état against the people’s government. In May 2000, when the CEP organized legislative elections and allowed participation of all eligible parties, the majority of residents voted. FL won the majority of its seats in the Senate and Deputy Chambers. Due to the overwhelming success of the FL, the United States, France and Canada, amongst others, claimed that the electoral process was fraudulent. Leaders of these countries pressured President Rene Garcia Preval’s administration to revise its electoral process and to repeat the election. Once again, in April, 2009 the United States, France and Canada, amongst others, supported flawed elections. These countries funded the 2004 coup d’état, and acclaimed these elections that excluded the majority of Haitians as fair elections. Canada has pledged to spend $5.8 million in Haiti’s upcoming presidential and parliamentary flawed elections. The United States promised $1.5 billion to the reconstruction of Haiti; yet this money has not yet been accounted for. However, the U.S. is pushing to spend millions of dollars to support the undemocratic and non-transparent elections in Haiti. This decision caused concern amongst U.S. members of Congress. They warned the U.S. government in their letter to push for fair, democratic and transparent elections in Haiti. Almost ten months after the 7.0 magnitude earthquake ravaged the capital and its surrounding cities, the majority of the earthquake survivors continue to live under makeshift tents. The earthquake killed more than 200,000 people, and left more than a million homeless, handicapped and gravely injured. Countries from all over the world pledged several billions of dollars to rebuild the country, yet these billions of dollars have not reached Haiti. No one knows when or even if they will ever receive the pledged financial aid. The November 28th elections are supposed to provide a beacon of hope for Haiti. Unfortunately, flawed and undemocratic elections which exclude large groups of essential Haitian stakeholders will kill this hope. Allowing all Haitians to participate in these upcoming elections will not only provide hope for change, but will allow them to physically put their country back on track. History has proven time and again that Haitians are faithful, resilient and brave people- given the opportunity, they will rebuild their own country. The United Nations Stabilization Mission in Haiti or MINUSTAH extended its mission on 13 October 2009, the extending mission’s mandate said, “The Security Council, by its resolution 1892, further tasked MINUSTAH with promoting an all-inclusive political dialogue and national reconciliation, and providing logistical and security assistance for elections anticipated for 2010.” If the UN’s mission in Haiti and its international associates cannot assume this position in these upcoming Presidential and Legislative Elections, they should leave Haiti. They should not continue to support the CEP. The CEP denies the right to vote, and to participate in the democratic process is undemocratic. It is also a violation of the rights of Haitian citizens to freely choose whom they want to lead their country.